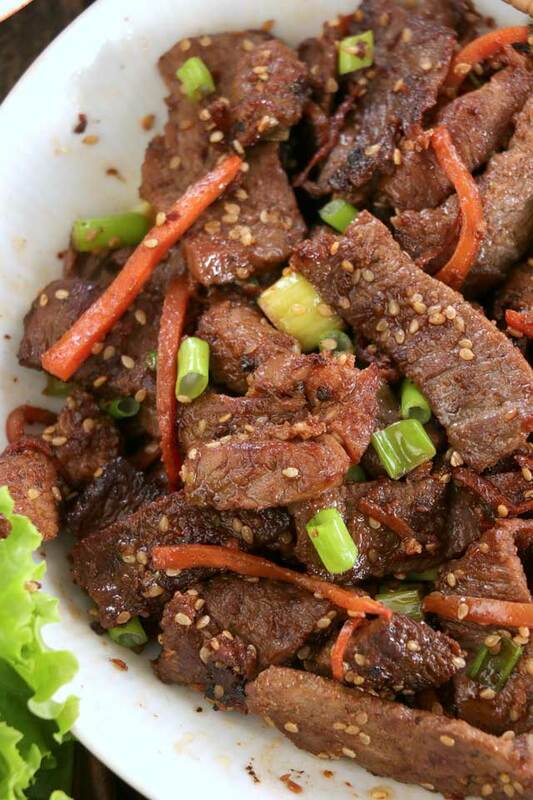 Got to love this easy Beef Bulgogi recipe. Thin slices of oh so tender meat marinated in flavor-rich savory-sweet bulgogi sauce and grilled Korean style. No grill or griddle? Don’t fret! This one is done stir-fried in a pan. 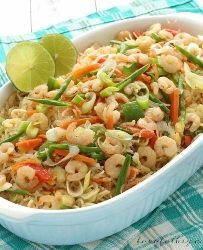 Simple vegetables like carrots and green onions add colors and flavor to this dish. Definitely one of the best way to introduce Korean food to your family and friends. 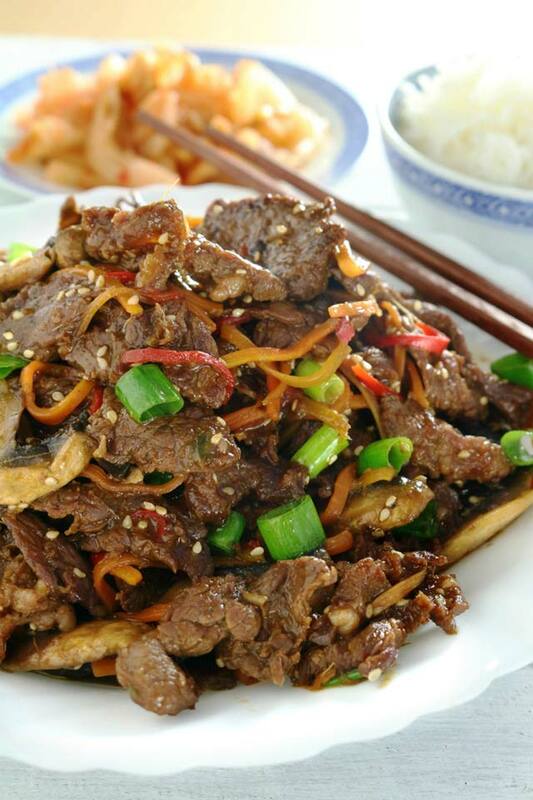 Bulgogi, that translates literally to “fire meat” is a traditional Korean barbecue dish. Although it generally refers to beef, other tender parts of pork and chicken can also be used. The meat is cut into very thin slices and marinated in a sweet-savory soy-based sauce with spices. It can also be made spicy. The usual cooking method is by grilling on a barbecue or stove-top griddle. 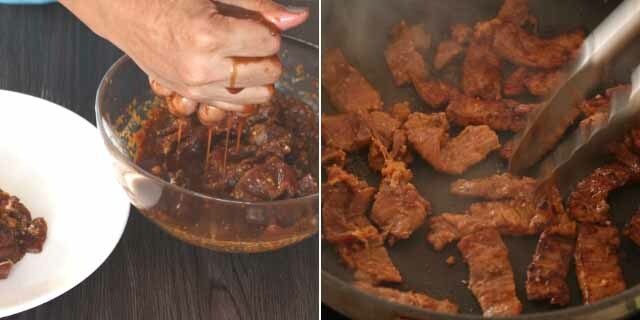 But stir-frying the meat in a pan is also a common method in modern home cooking. Korean food has become increasingly popular in the Philippines as proven by the numbers of Korean restaurants that are opening everywhere. In Pampanga, where I grew up, there is a place that is now known to be a ‘Korean Town’. Shops and many businesses owned by Koreans who decided to settle down in the area dot the area. This place is near where I used to work, in Clark. In those days, this was the only go-to place in Pampanga to get authentic Korean food. Which I frequented with friends, colleagues and family. I also brought Armin there on his first visit to the Philippines for his first taste of Korean food. Needless to say, he loved it! 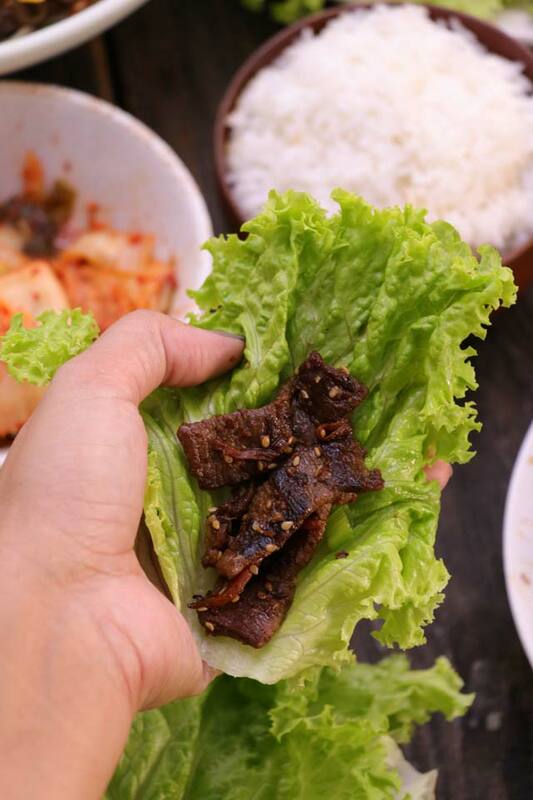 Beef Bulgogi is one of my favorites, of course, together with Samgyeopsal and Kimchi. I remember how much I miss eating Korean food while we were in Germany as it is not (yet) so popular there. Thank goodness for modern technology that makes it easy to look up for recipes online. It is a hit or miss thing, of course. Not necessarily because some recipes are not good. Ok, sure there are some. But mostly it has to do with meeting one’s expectations. I read and tried a lot of them before I finally found the one that I really like best. This recipe was actually inspired by not just one but two sources. One is A Spicy Perspective and the other is My Korean Kitchen. 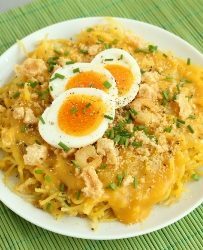 I took the parts and pieces of advice I like from each and combined them to make this recipe. Freeze before cutting. 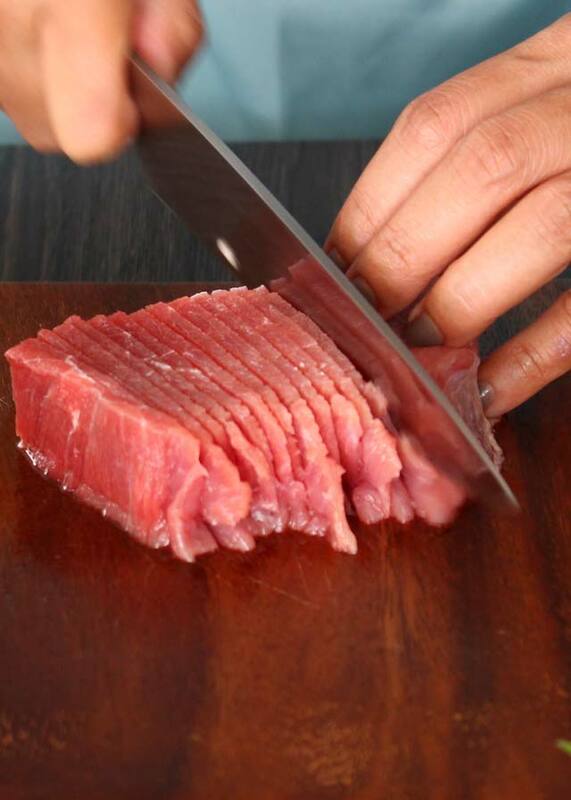 This is a neat trick to easily cut the meat in very thin slices. If it is a bigger chunk of meat, cut it in smaller sizes that are about 3 inches thick. Wrap them individually with a plastic wrap and place in the freezer until partially frozen. Make it more tender. Asian pears not only add a sweet flavor to the marinade but also tenderize the meat. Try not to skip it! Unless you are using tenderloin, maybe. I also decided to add some vegetables to my Beef Bulgogi, which is totally allowed, like carrots, bell peppers, and mushrooms so it is like an all-in-one meal, especially great for those on the low-carb diet. Cook in smaller batches. As you pan-fry the meat, it will release juices that should turn to steam if it has the room and space to do so. An overcrowded pan will prevent this from happening and will collect liquid instead. We are not steaming but stir-frying. Cook on a hot skillet. The thin meat will cook faster without drying out and will give it a nice char and smokey flavor. A well-marbled tender cut of meat is ideal for grilling or pan frying. 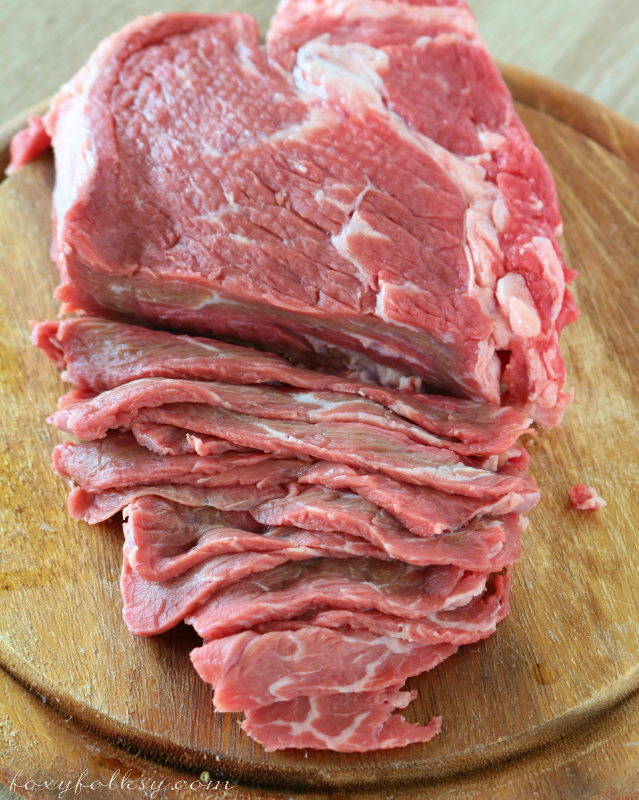 The most commonly used cut for Bulgogi is the ribeye. Sirloin and tenderloin would also work well. Ribeye, taken from the rib part of a cow, is rich in flavor and juicy because of the high amount of fat marbling the meat. Sirloin, although delicious, is not as flavorful as the ribeye but is perfect if you like leaner meat and usually cost lesser than a ribeye. Like sirloin, tenderloin doesn’t also have a lot of fat but is an extremely tender cut with a milder flavor. The most expensive cut of beef. 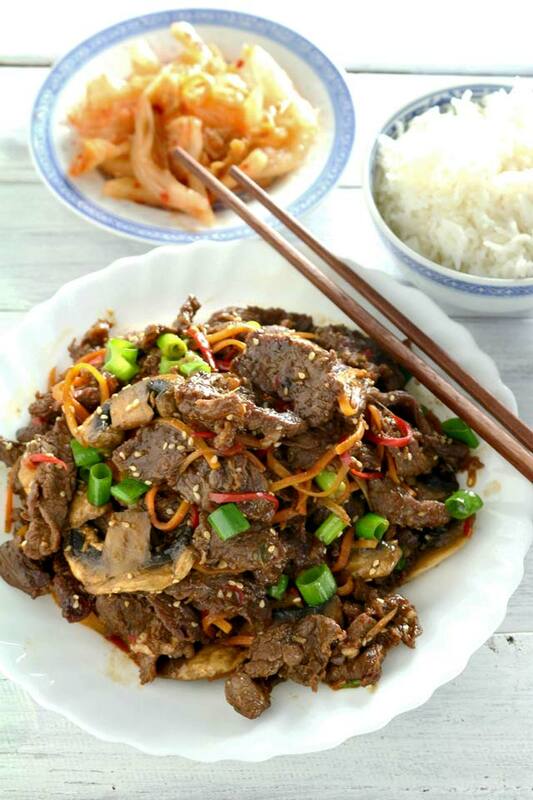 Try this easy recipe for Beef Bulgogi, a classic Korean dish of grilled marinated beef that it is also great stir-fried. Added some veggies and its so good! Combine all ingredients for the marinade in a mixer or blender and pulse a couple of times until the garlic and ginger are chopped into fine bits. 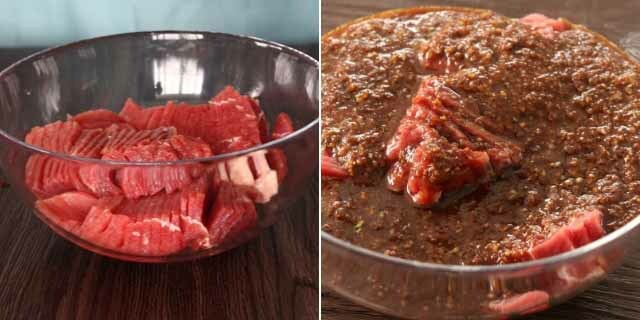 Place the beef slices in a bowl and pour the marinating sauce into it. Mix with your hand making sure every meat is covered. 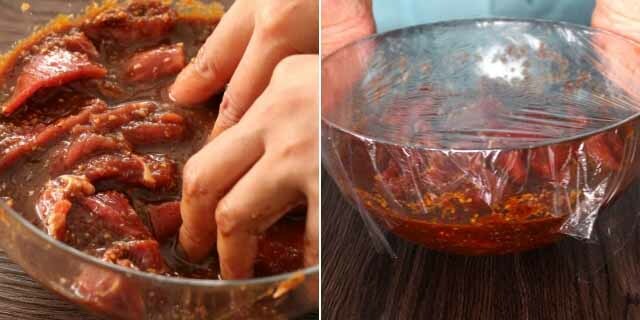 Cover the bowl with plastic wrap and let it marinate for at least an hour. 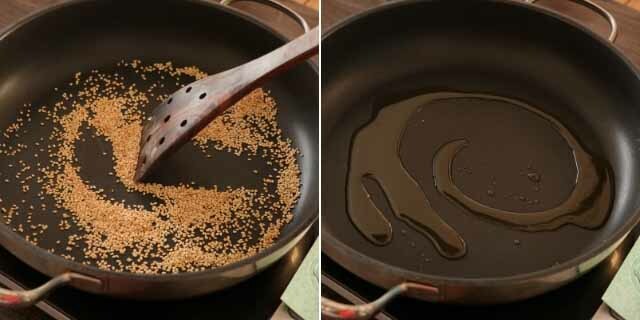 Heat skillet or wok over medium heat and toast your sesame seeds until golden brown. Remove from wok/skillet and turn heat to high.Add sesame oil into the hot wok or skillet. Wring out the liquids from the meat using your hands. Once the oil is hot, add half of the meat using tongs spreading them around the skillet. Let them sear on one side first then stir until all is cooked and have a nice brown color. Do not overcook the meat so it stays tender. Remove from skillet using tongs and do the same on the other half of meat. Set meat aside once all done. In the same skillet, add a bit more of sesame oil if needed. 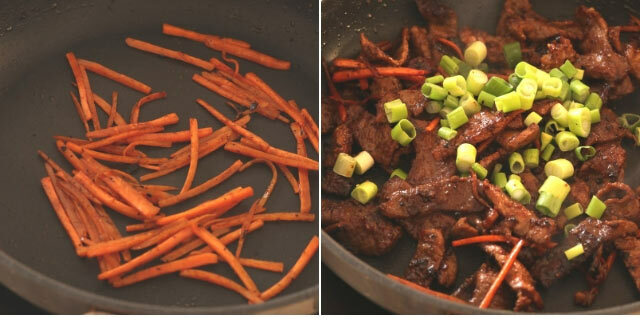 Add the carrots and stir fry for a few seconds until tender-crisp. (see Note 1) Add back the cooked meat to the skillet and the toasted sesame seeds and green onions stir a couple of times until fully mixed. Transfer into a serving dish. Serve with Kimchi and rice while still warm. Note 1. If adding bell peppers and mushrooms- Add 1/4 cup water to the bowl used for marinating and add this to the vegetables in the skillet. Let it simmer for a few minutes just until the veggies are about cooked. Beef Bulgogi was first published in 2015. Updated in 2019 to include new photos and additional tips.